Both of these teams shockingly didn't qualify in the first round of EB qualifying and will have to beat each other out for a spot in the final Eurobasket field. Looks like Parker is healthy to play, bad news for the French team is the Bulls aren't allowing Noah to play after letting him play in a few friendlies. I think Italy takes this since they're more well rounded and mesh better together than a French team that seems to be all flash and no substance. Is there any where we can watch it? Also I dont think parker is playing. Tomorrow, in the early european evening (i think around 19.00 Greenwich time). Will somebody provide a link when it's game time? Does France have any white players and why is Petro starting over Turiaf? Guess I'll be rooting for France on this one. 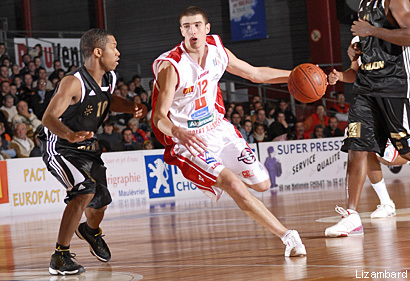 Nando de Colo, second round pick of the Spurs this year. Petro a legit center and they like Ronny as a spark off the bench. I thought Parker was barred from playing this game by the Spurs. Also, Vitaly is a point guard. Ok. I will if I remember of this thread. I thought so too, bit they said he'll be playing against Finland so I'm assuming he may have convinced the spurs otherwise. I don't care if he plays or not, italy is better. Nicolas Batum has started in every one of France's warm-up games. Pretty sure he'll start in this game as well as he's their best perimeter defender. They'll likely stick him on Belinelli. I'm predicting a French victory. Reports are saying that a lot of players on the Italian national team are out of shape (Bargnani has been singled out be his coach for not being in shape), I don't think they can keep up with France's athletes. Noah not playing is bad news for France ?